One of the biggest contributors to high electric bills is summer air-conditioning. That should make finding ways to lower your air-conditioning usage a necessity. There are ways you can do this without investing a lot of time or spending a lot of money. 1. Make your home as airtight as possible. Most of us are well acquainted with the idea of weatherproofing our house for the winter, but it often seems to be less important in dealing with the summer heat. But just as cold air flowing into your home reduces the efficiency of your heating system, heat coming in through cracks in the summertime force your air conditioner to work harder. If you didnâ€™t caulk or weather strip before this past winter, you should do so now before summer hits with a vengeance. Caulk any cracks around doors and windows, and weather strip any large spaces as well. You may have done so a couple of years ago, but both caulking and weather stripping have a way of deteriorating quickly. A steady flow of hot air seeping in your house will not only cause your air-conditioning to work harder, but may also cause imbalances in room temperatures. For example, the temperature in an interior room could be 72Â°, but 79Â° in an exterior room with significant points of entry for hot air. If you are not sure if you need to caulk or weather strip a door or window, use the light test. At night, turn off all the lights in a room, shine a flashlight around the edges of windows and doors, and if any light comes through from the outside of the house youâ€™ll need to caulk or weather strip. 2. Make good use of fans. If a particular room â€“ or even the entire house â€“ seems to be a little bit too warm, the problem may not be the air conditioner, but a lack of air flow. Sometimes all you need to do to fix the problem is to set up a fan in a room to keep the air moving. Another good use for fans â€“ particularly attic fans â€“ is to use them on days when itâ€™s not quite hot enough for air conditioning, but not quite cool enough to go without them. This can be late spring, early fall, or even at night. 3. Have your system serviced early in the year. In an attempt to save money, many people avoid having their air-conditioning systems serviced until there is obvious evidence of a problem. But a better idea is to have it done at the start of the air-conditioning season, that way potential flaws can be remedied and your system will be at maximum operating capacity for the entire season. Itâ€™s often thought that an air conditioner is breaking down, when all it needs is a Freon recharge. A blower that is doing little more than pushing warm air around the house is mostly wasting money. You can generally have this done for somewhere between $150-$200, and it will save you money on your electric bills throughout the season. This will also be an excellent time to replace your air conditioning filter if you have not done so already, as a clogged air filter will force your air conditioner to work harder. 4. Look into window treatments. A home can look especially beautiful when sunlight is streaming in through the windows or skylights. But sunlight also warms the air in the building. Unfortunately, sunlight and air conditioning do not represent a happy marriage. In order to maximize the efficiency of your air conditioner, youâ€™ll have to minimize the amount of sunlight that is coming into your home. This does not mean that you have to cover all the windows in your home with room darkening shades, but you should look for some type of window treatments that will at least minimize the worst of the sunlight. 5. Raise the setting when youâ€™re not home. Probably the most wasteful thing you can do with air-conditioning is to set it at a single temperature in May, and not turn it off again until October. Yet this is what many people do, and they are spending a lot of money for no legitimate purpose. You may need to set your air conditioner at 72Â° or 75Â° or whatever temperature youâ€™re comfortable at â€“ while you are at home. But if you are away on vacation, or during a work day when no one is home, you can easily raise the setting 80Â° or higher. Unlike heat in the winter time, thereâ€™s no risk of bursting pipes â€“ or any other disasters â€“ that are likely to happen because your air-conditioning is either at a very low setting or completely turned off. 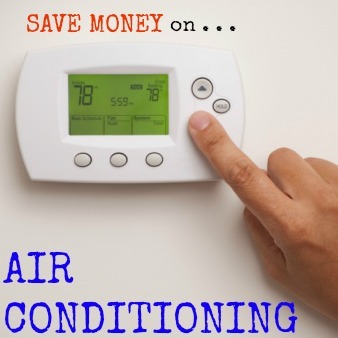 What strategies do you use to lower the cost of your air-conditioning during the summer months? Leave a comment! I live in an apartment and I have an interesting situation. The windows in two rooms are older (ie – draftier); and the windows in my master bedroom are newer. I keep the doors shut during the day and use the AC in the living room (a window unit) and fans, to cool the apartment. Thankfully, the room I use as an office (with no AC) stays cooler during the day b/c of the direction of the sunlight. I’d still like to find a way to keep my electric bill a little lower this summer. In years past, we would get the place be a little warmer, but my fiance now has a heart condition so I don’t mess around with the heat, even if it does mean paying more.